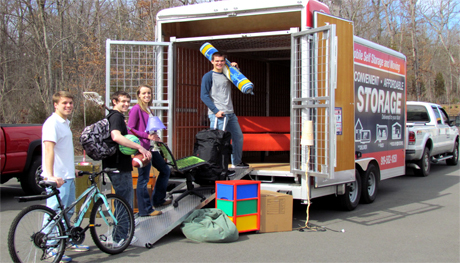 Zippy Shell Storage and Moving of Long Island is proud to serve the Stony Brook University community and offers the most flexible, convenient and affordable storage solution for students and faculty. We bring a Zippy Shell trailer with a storage container inside to your campus residence. You can load your items into the secure container or we can help with packing services. Boxes, furniture, bikes, sporting equipment – Zippy Shell makes storing anything simple and easy! Once you have loaded your items, we take the locked container and place it in our secure, climate-controlled facility. When you need your items back at the beginning of the fall semester, call Zippy Shell and we’ll return your items to your new campus location! If you need to store your items longer, we can accommodate. Zippy Shell also offers local moving services!